Patient reported to have LBM X 7 since morning (its now 7pm). Aide reported only 1 BM all day, soft and formed. MD ordered NS with KCl 20mEq. 0.5% Dextrose and .45NaCl with KCl 20mEq given, patient tolerated well. Patient has NO history of DM or not on sugar watch. What could be the a/e of the given IV? 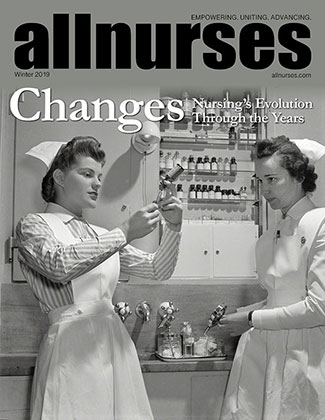 What would be the anticipated nursing measures? Documentation? Corrections? Repercussion? Is this homework? If so, what do YOU think? Also I think you mean 5% dextrose not 0.5% .05= 5% .5= 50% which is usually in a 50ML bolus used for acute hypoglycemia. I would do an incident report and document what was used and how much and any s/s related to fluid overload. edema, lung sounds etc. I'd ask the charge nurse if the MD needs to be informed and who does it. What I don't know is how you are required to document it in the patient chart. This forum isn't a place to have s stranger do your homework. Hi meanmaryjean. this is not a homework. it was a discussion I heard from a colleague who heard it from a colleague, who heard it from a colleague. Hi jennylee321. what made you say this was a homework? ^^ This makes me skeptical. Again- what do YOU think? How did the 'colleague' respond? the colleague who shared the story was not the owner of the story so I didn't know how the owner handled/responded. Asking my question back to me, I thought it that it needed to be documented appropriately such as "md ordered_____, ________given. patient monitored closely. no a/e (if really no a/e) of _____. would you have other or better ideas? nursing measures: close assessment of pt x 3 days or per facility protocol. would you have other ideas? corrections? I don't know what would be the correction on the nurse's part but maybe ask. should it be coming from the md? would you have other suggestions? repercussion: I don't know...would you know? Is this how all the "nurses eat their young" rumors start.? So what if its a homework assignment. They asked because they were not able to find the answer. I know we have not been taught what gets reported and to who, ramifications of the mistake from a disciplinary POV. would be great if you could answer those questions. I learned in another thread here that when asked to do something unethical or out of your scope of practice by an MD, you are not to chart that event but put it only in and incident report. So does the same apply here or do you need to change the given med to show the actual IV fluid used and make a notation in the chart. We are here to learn... BTW, do you think my answer was correct? Then the OP should have been specific about how the story actually came about, what was done about it and what were her thoughts on the matter. Then we could weigh in with what we agree with and what we disagree with. That's a discussion. Just throwing out a random question with no thought process attached smells like homework. Before we contribute, we need some assurance that we're not just doing a lazy person's homework for him/her. Sorry, had to. Couldn't help it.